Originally, it was built in 1814 as The Farmers & Mechanics bank at the intersection of M Street and Wisconsin Avenue in the Georgetown neighborhood of Washington, D.C. A architectural coin bank replica was originally made by Rehberger and then in the 1990’s these banks were reproduced from the original molds and you can see both versions above. 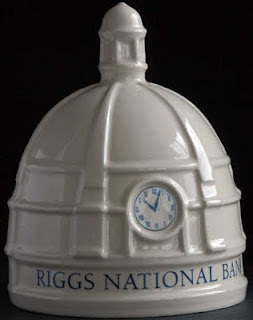 Later, Riggs National Bank purchased the building and produced a white ceramic coin bank replica of just the dome. Currently, a PNC Bank branch is located in the historic building. Designed by architects Marshall and Peter in 1922, the neoclassical building is a contributing property to the Georgetown Historic District and is a National Historic Landmark.